Electrochemisty at Metal and Semiconductor Electrodes covers the structure of the electrical double layer and charge transfer reactions across the electrode/electrolyte interface. 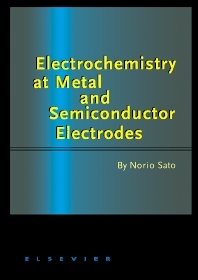 The purpose of the book is to integrate modern electrochemistry and semiconductor physics, thereby, providing a quantitative basis for understanding electrochemistry at metal and semiconductor electrodes. Electrons and ions are the principal particles which play the main role in electrochemistry. This text, therefore, emphasizes the energy level concepts of electrons and ions rather than the phenomenological thermodynamic and kinetic concepts on which most of the classical electrochemistry texts are based. This rationalization of the phenomenological concepts in terms of the physics of semiconductors should enable readers to develop more atomistic and quantitative insights into processes that occur at electrodes. The book incorporates many traditional disciplines of science and engineering such as interfacial chemistry, biochemistry, enzyme chemistry, membrane chemistry, metallurgy, modification of solid interfaces, and materials' corrosion. The text is intended to serve as an introduction for the study of advanced electrochemistry at electrodes and is aimed towards graduates and senior undergraduates studying materials and interfacial chemistry or those beginning research work in the field of electrochemistry. 1. The Energy Level of Particles. Particles and particle ensembles. Chemical potential and electrochemical potential. Electrochemical potential of electrons. The reference level of particle energy. Electrostatic potential of condensed phases. Energy levels of charged particles in condensed phases. References. 2. The Energy Level of Electrons. Energy levels of electrons in condensed phases. Electrons in metals. Electron energy bands of semiconductors. Electrons and holes in semiconductors. Energy levels of electrons in semiconductors. Metal oxides. The surface of semiconductors. Amorphous semiconductors. Electron energy bands of liquid water. Redox electrons in aqueous solution. The electron level of normal hydrogen electrode. References. 3. The Energy Level of Ions. Ionic dissociation of gaseous molecules. Metal ion levels in solid metals. Ion levels of covalent semiconductors. Ion levels of compound semiconductors. Ion levels in aqueous solution. Thermodynamic reference level for ions. References. 4. Electrode Potential. Electrode. The interface of two condensed phases. Electrode potential. Electrode potential in charge transfer equilibrium. Measurement of electrode potentials. Potential of the emersed electrode. References. 5. Electric Double Layer at Electrode Interfaces. Solid surface and adsorption. Electric double layer at solid/aqueous solution interfaces. The potential of zero charge on metal electrodes. Thermodynamics of adsorption on metal electrodes. Electric double layer at metal electrodes. Contact adsorption and electric double layer. Particle adsorption on metal electrodes. Electric double layer at semiconductor electrodes. Band edge level pinning and Fermi level pinning. The space charge layer of semiconductor electrodes. The compact layer at semiconductor electrodes. The surface state of semiconductor electrodes. The flat band potential of semiconductor electrodes. References. 6. Electrochemical Cells. Electrochemical cells. Electromotive force of electrochemical cells. Equilibrium potential of electrode reactions. Electrochemical reference level for hydrated ions. References. 7. Electrode Reactions. Electrode reactions. Reaction rate. Reaction mechanism. Rate-determining steps of reactions. References. 8. Electrode Reactions in Electron Transfer. Electron transfer at metal electrodes. Electron transfer at semiconductor electrodes. Reaction current at semiconductor electrodes. Complexation and adsorption in electron transfer reactions. Electron transfer at film-covered metal electrodes. References. 9. Electrode Reactions in Ion Transfer. Metal ion transfer at metal electrodes. Ion transfer at semiconductor electrodes. Ion adsorption on metal electrodes. Ion adsorption on semiconductor electrodes. References. 10. Semiconductor photoelectrodes. Quasi-Fermi level of excited electrons and holes. Photopotential. Photoexcited electrode reactions. The rate of photoelectrode reactions. Photoelectrochemical cells. Photoelectrolytic cells. Photovoltaic cells. References. 11. Mixed Electrodes. The single electrode and the mixed electrode. Catalytic reactions on mixed electrodes. Mixed electrode potential. Passivation of metal electrodes. References. List of Symbols. Index. Professor Emeritus at Hokkaido University, NS Electrochemical Laboratory, Japan.